COLUMN: Being a Spartan isn’t about the university. It’s about the community. A woman grabs a ribbon from MSU students "Go Teal" advertising submission during the Addys on March 14, 2018 at Kellogg Hotel and Conference Center. The annual ad competition brings together MSU students and faculty in the Advertising department and other Michigan based creatives to show their best work. In the midst of a chaotic newsroom during a chaotic time at Michigan State, someone in the office checked Twitter to see protesters, originally at the Rock on Farm Lane, had reached Grand River Avenue by the hundreds. We ran to the windows to watch the March for Survivors and Change at MSU from two stories above. What I saw completely changed my perspective. Our university was making headlines left and right for its involvement in the Larry Nassar scandal. Everyone in the newsroom was working harder than ever to cover his sentencing and the many changes and resignations in the administration. Two days after Nassar was effectively sentenced to life in prison and President Lou Anna K. Simon resigned, we were staying late again on Jan. 26, 2018, the night of the March for Survivors and Change at MSU. We were stress eating. We were tired from the longest week of our short careers. We were anxious all the time — at least I was. We ran to the windows of our office to watch the march down Grand River Avenue. We watched the crowd of angry students, professors and community members demanding their once-beloved university do the right thing. It cleared my fears of the future. I made a resolution that day to not be ashamed of being a Spartan if it meant I was a part of a community that demanded change. To be fair, this has been a challenge. I have cringed through the administration’s faux pas and canned responses instead of healing words. I feel awkward when someone suggests that my MSU degree will be a detriment to my resume. I feel even more awkward when someone makes a point to not wear green and white — my wardrobe would be significantly smaller if I got rid of my Spartan gear. But even in the toughest moments, I am reminded of the marchers’ irrepressible calls for responsibility. This university’s actions created a community of the most determined people; one that accepts nothing but the best for itself. 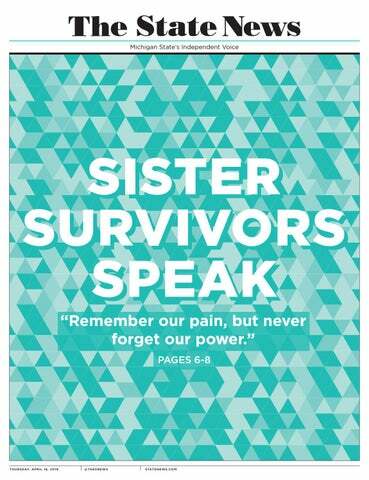 We faced nonstop adversity for two years, but always believed survivors and demanded institutional change. We’ve awoken the nation to the effects of serial abusers and poor leadership. When MSU became a national story, we weren’t sheepish about our distrust in administration officials. Revolutionary leaders worked with survivors, investigated new claims, called for resignations and learned how to make a better society — all in the public eye. We wanted to be an example of how to stop widespread sexual misconduct crises from happening, or how to heal if one did. Dozens of people still show up at Board of Trustees meetings and put teal ribbons on trees. They draw posters and march and scream and yell and continue to expect priority adjustments from the top down. It seems possible the community’s rallying has been heard. Administrative rhetoric is shifting; once the new president is selected, the community might begin to feel at ease. But change can start sooner, as new interim president Satish Udpa said at the board meeting. This community is the reason he is calling for a culture shift. We have never stopped demanding change. If the past year is any proof, we never will. Being a part of a new culture that demands accountability is nothing to be ashamed of. McKenna Ross is a copy editor at The State News. She served as managing editor during the 2017-18 academic year.